In the end, it fizzled out. The Left’s calculation that a majority in the Lok Sabha would speak up against the nuclear deal has gone awry. Regional parties, which seldom have a view on foreign policy issues, have apparently endorsed the deal in the debate on Wednesday. If the government got a pleasant surprise from regional parties, the Bharatiya Janata Party (BJP) and the Left cohort were unsurprising in their behaviour. The Left, for its cussedness and refusal to see reason, and the BJP for its anxiety to appear different from the Congress. The BJP’s conduct was particularly deceitful. It began the post-Cold War rapprochement between India and the US. The first faltering steps towards nuclear normalization were also taken by it. What has changed since May 2004 for it to claim the deal will bring India under American thrall? Some things will remain constant on India’s political firmament. The debate in the Lok Sabha showed this once again. First, the weak link between domestic politics and foreign policy, notwithstanding the Left’s hard attempts to join them. Two, the leeway that any elected government has on managing and securing the country’s interests abroad. Consider the attitude of the regional parties, especially the United National Progressive Alliance. It now seems that the course from animosity to the deal to finding it favourable had more to do with the dynamics of their relationship with the Left than the merits of the agreement. At the height of bonhomie with the Left, they croaked anti-deal arguments. To what extent has that tune changed now? The Samajwadi Party is a study in these contrasts. From the vitriolic anti-American stand in early February, when it took a stridently pro-Saddam Hussein line, to a rather neutral position on Wednesday, it has come a long way. The fear of facing the electorate is also likely to have softened its stand. This, however, seems truer for parties in the United Progressive Alliance (UPA) than the Opposition. At the same time, all regional parties have localized concerns, centred around local constituencies. For them to aggregate into one voice the foreign policy preferences of these constituents, many of whom simply have no opinion on such matters, is difficult. This difficulty was visible in the Lok Sabha on Wednesday. The abstention of the Telugu Desam Party and the waffling of the Biju Janata Dal during the debate seems indicative of this phenomenon. The Left, for all the wrong reasons, tried to show them the “way", but happily for India, that attempt failed. These parties overcame, if only for a moment, their provincial outlook. After this, the government has a clear road as far as foreign policy is concerned. This was not in doubt, but the Left tried its best to create apprehensions on this front. From its demand that everything the government did abroad be “cleared with it first" to the meaningless motions of the Left-UPA committee on the nuclear deal created this impression. The Left and the government, have to realize that steering foreign policy is the right of the government of the day and cannot be hostage to any constituent of the alliance, however powerful it may be. If the framers of the Constitution deemed it fit to keep foreign policy decisions away from Parliament and the din of politics, they had sound reasons for doing so. It’s time the government demonstrated its resolve on securing the deal. With some clarity on the sense of the Lok Sabha, and the Left on the back foot, it’s high time the government set aside its existential fears. No party in India wants elections now. 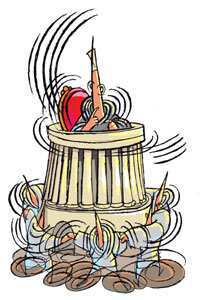 From now on—including when the debate happens in the Rajya Sabha—success on the deal hinges on the government’s deftness in political management and its will. It would also be interesting to see if the government can show some deftness and will in delivering on some of its promised economic policy reforms.